Richard Turner-Pearson wasn’t always on the path to becoming an Engineer. He spent years figuring out what he wanted to do before returning to college as a mature student and completing an apprenticeship in Engineering, which eventually led to a degree. “I worked in retail for more than 10 years, despite having two different degrees already,” Richard said when he spoke to our Alumni Team. “I started by going to Derby University for a History degree in 2000. After deciding it wasn’t for me I joined a large retail firm and worked my way up to Cycles Manager. I then went back to university for a Media degree in 2005. However, I ended up back in retail for a further four years before working at Toyota on the production line. 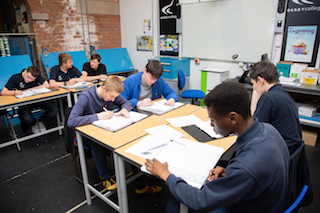 “I applied to apprenticeship at Toyota and Rolls-Royce at similar times and through the Rolls-Royce apprenticeship scheme I was introduced to Derby College, where I completed my BTEC Level 3 in Engineering. Through this first reintroduction to education I completed my foundation degree and degree with Derby College. “Passing my degree was a proud moment, as was getting my role after the apprenticeship,” he said. Richard also explained how his time at Derby College helped him get where he is today. “I appreciate that I now have a recognised qualification that I can use in my industry. This has really helped with job progression,” he said. “I’ve also gained the ability to look at a problem and use the skills I have to find a solution – this has been invaluable. “I have now worked in my present role as a Controls Engineer for Rolls-Royce for three years,” said Richard. “I manufacturer small-batch prototypes and deal with all aspects of the development of the design. So, what’s next for Richard? “I would like to achieve chartered status and work my way up the business and ensure that the next generation of engineers are catered for,” he said.